Four days of luxe in the Balearics leaves me with mixed emotions. It cost a lot. We’ve never done anything this expensive, in the more-than-a-decade since we’ve had kids: it’s their first ever flight on a plane. It was absolutely lovely in the main. We didn’t pinch the pennies, and largely had and did what we all wanted. We also succeeded with multiple modes of transport: car, bus, plane, hire car, ferry; navigating ‘sin plomb’ with aplomb, in the obligatory last minute hire-car-drop-off-petrol-top-up-panic – arriving with fully 5 minutes to spare. A breeze through the airport, and as I sit here with bad inflight coffee in hand, it’s all been very good. But you couldn’t but notice that the many kind and smiling people who served us on our hols, weren’t anywhere near as flush as we are; and back at home we feel poor enough. The nice young man, at last night’s eye-wateringly expensive restaurant, has a small son and daughter in Spain. A need for work took him hundreds of miles away from them – to serve us unnecessarily fancy food at our boutique hotel. On the next-to-last leg we went the wrong way round the Ibiza Port one way system; and drove past a three storey yacht. Complete with polo shirted crew and chi chi cocktail party “How much would one of those cost?” my daughter asked. Her mother and I had no idea. But one thing is for sure, absent major criminality, venal corruption or sustained workplace psychopathy – and I don’t do those – the massive yacht will likely elude us. At the airport, the first thing ‘free wifi’ served up, was one of my colleagues tweeting from a refugee camp in Beirut, about the everyday courage of people protecting and promoting their arts and culture in Lebanon. Puts it all in context. 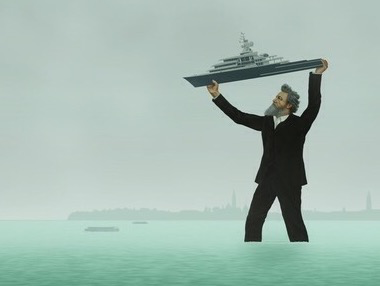 Jeremy Deller’s ‘We sit starving amidst our gold‘ captures the right attitude to that super yacht for me; a giant William Morris, the great Victorian social reformer, lifts and hurls one into the sea. We had a lovely lovely time. But luxury is expensive, intoxicating and addictive. Like all such delights, it is best tasted sparingly.